The reactivity-centered component of the Sorensen Lab is driven by the search for new strategies for the activation of unreactive C–H bonds in an efficient, sustainable manner. As part of our involvement with the NSF Center for Selective C-H Functionalization (NSF-CCHF), we aim to expand the menu of catalytic transformations available to organic chemists through careful design of processes that may or may not have close neighbors in the chemical literature. 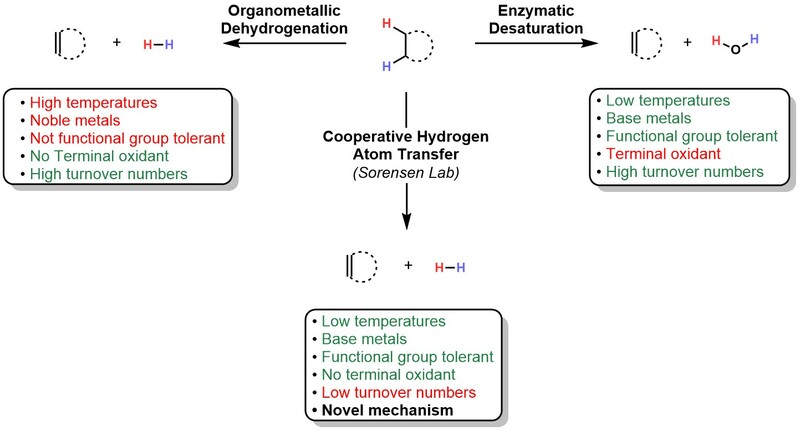 Cooperative Hydrogen Atom Transfer (cHAT) – Enzymatic desaturation is thought to occur through sequential hydrogen atom transfer reactions to a single, high-valent metal catalyst which is then regenerated via reoxidation from a stoichiometric electron acceptor. Using this low-temperature desaturation as an inspiration, we have designed a system where each hydrogen atom is accepted by a different catalyst; these two reduced complexes can then be regenerated via a hydrogen evolution step, obviating the need for a stoichiometric oxidant. This stepwise, cooperative hydrogen atom transfer mechanism using base metal catalysts is currently being applied to a variety of dehydrogenative transformations. Julian G. West, David Huang & Erik J. Sorensen Nat. Commun. 2015, 6, 10093. Abrams, D.J. ; West, J.G. ; Sorensen, E.J. Chem. Sci. 2016. Underdeveloped Visible Light Photocatalysts – In our search for suitable partners for cHAT, we have found that there is a dearth of catalysts capable of visible light-mediated HAT of unactivated bonds in the synthetic literature. Towards remedying this deficiency, we are currently developing synthetically-useful catalyst systems for HAT using earth-abundant metal complexes. We are also working on applying these catalysts to non-HAT transformations. West, J.G. ; Bedell, T.A. ; Sorensen, E.J. Angew. Chem. Int. Ed. 2016, 55, 8923.